TREND CHANNELS - The oil price for the whole of the 2018 has been trading within the upper band of trend channel that extend towards a high of $80 by the end of 2018, which is the primary reason for my original forecast target. So far the trend channel has held of breaking into the lower channel therefore current support is at $67 which should contain any correction lower. However whilst bullish, the trend channel curve as I mentioned in April is quite shallow which means the progress higher for the crude oil price is likely to be slow which so far is the pattern observed. So don't expect a sudden spike to $100 any time soon, instead it's a steady quiet trend higher, probably under the radar of many investors who likely will wake up to news of crude oil hitting $80 and wondering how it got there out of the blue. RESISTANCE is at previous major support at $90 which suggests oil price trend should continue higher towards that level. SUPPORT is in the area $58 to $60, and $64 that should contain corrections within the rising trend channel. ELLIOT WAVE - Elliott wave is implying that the oil price will breakdown and target $60 BEFORE heading higher once more i.e. currently in a Wave 4 correction, of which approx half has been completed, therefore suggesting $60 rather than $80 by late December. So EW is not matching trend analysis. SEASONAL ANALYSIS - oil prices tend to rally into late summer and then fall into early winter, which supports what elliot waves are saying. 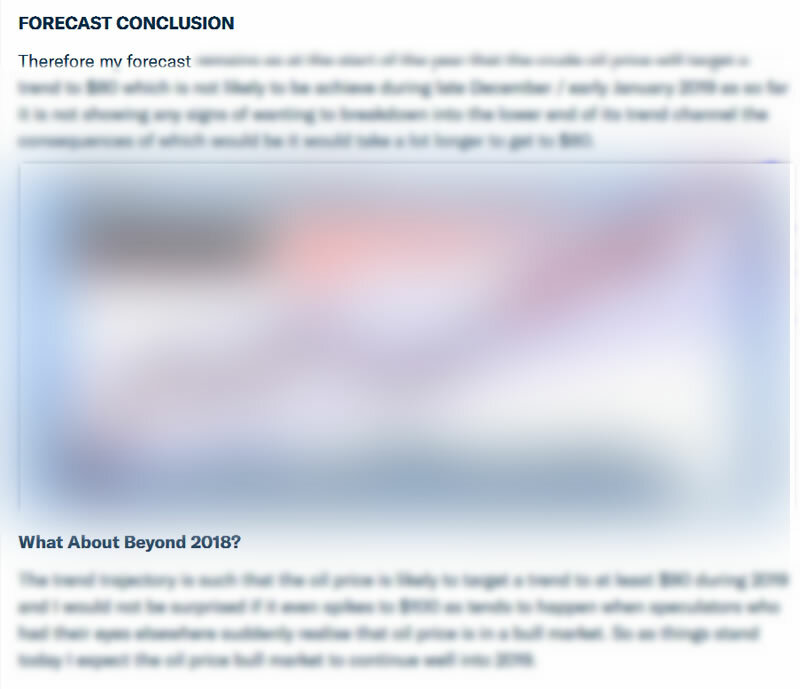 My forecast conclusion was first been made available to Patrons who support my work. So to get immediate First Access to ALL of my analysis and trend forecasts then do consider becoming a Patron by supporting my work for just $3 per month. https://www.patreon.com/Nadeem_Walayat.